This picture, taken recently and received from the Toyko metropolitan government, shows a 124-kg female giant panda at an undisclosed location China. A pair of giant pandas are headed for Tokyo's Ueno Zoo soon, where the fluffy bamboo eaters are set to delight the crowds from early next year. A pair of Chinese giant pandas are soon headed for Tokyo's Ueno Zoo, where the fluffy bamboo eaters are set to delight the crowds from early next year. The Tokyo metropolitan government, which runs the zoo, this week finalised a deal under which it will pay a giant price tag of almost a million dollars a year for the next decade to keep the animals. The money is to be spent on wild animal protection in China. 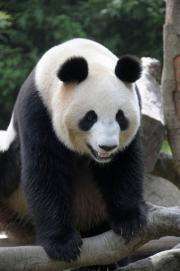 The zoo will ask the Japanese public to nickname the two pandas, a 143-kg male and 124-kg female, media reports said. An extension of the lease can be negotiated, a Tokyo official said, and the zoo can keep babies born to the pair for the first two years, although China retains their ownership. The crowd-pleasers are expected to boost attendance at the zoo, which attracted three million visitors last year, down from a peak of more than seven million in the mid-1970s. Ling Ling, the zoo's last panda, died of heart failure in 2008 at the age of 22 -- the equivalent of 70 human years. The new pandas will come to Japan in line with a 2008 agreement between Chinese President Hu Jintao and then prime minister Yasuo Fukuda.